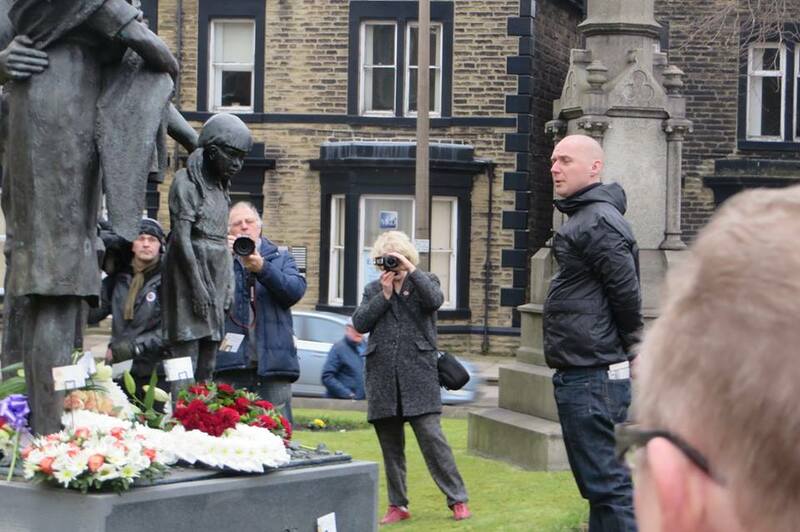 New film explores lives of children during 84-85 miners’ strike. 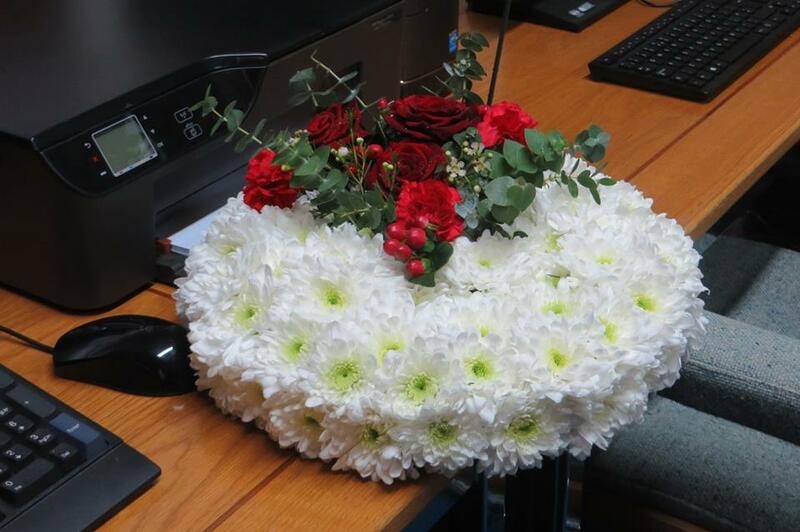 This article by Hajera Blagg originally appeared on UniteLive. “I Support My Dad” explores how the 1984-85 miners’ strike affected the lives of children who were involved in the protest in North Staffordshire. Produced by Stoke-on-Trent based film company Inspired Film and Video, the documentary features as part of a social history project to commemorate the 30th anniversary of the miners’ strike in North Staffordshire. The project, which secured Heritage Lottery Fund funding, explores the experiences of children growing up in the mining community at the time of the strike and retells their stories of what life was like on the picket line and how this shaped their adult life. “I Support My Dad” premieres on the June 24 at the Stoke Film Theatre at 7pm and is available for broadcast. You can view the full documentary here. A Packed Programme of Activity on the Miners’ Strike. Four floors of an underground car park in the centre of London will be the dramatic setting for 50 of the Durham Miners’ Association banners. The venue is Leicester Square Car Park, 39-41 Whitcomb St, London WC2H 7DT. Diamonds, will be on display. Another floor will have videos projecting onto the walls of the car park. 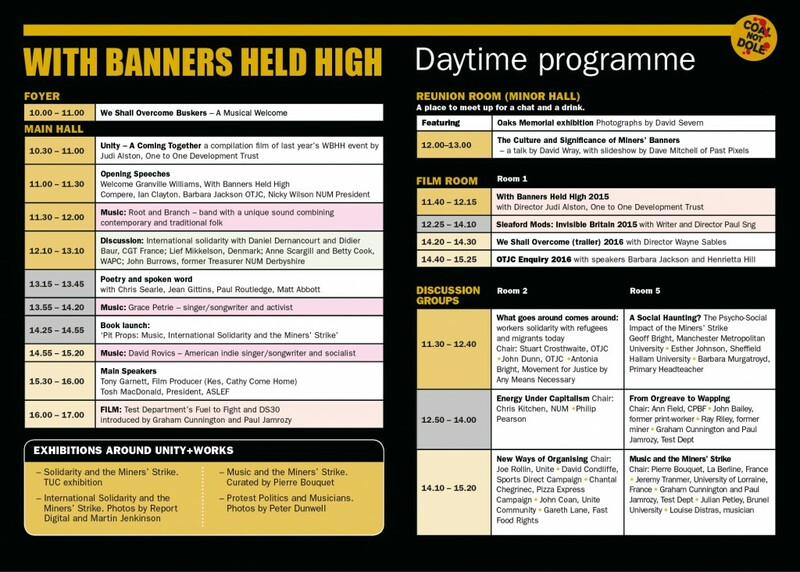 On the fourth floor will be a bar run by the Workers’ Beer Company, exhibitions and a series of talks, debates and films on the miners’ strike. 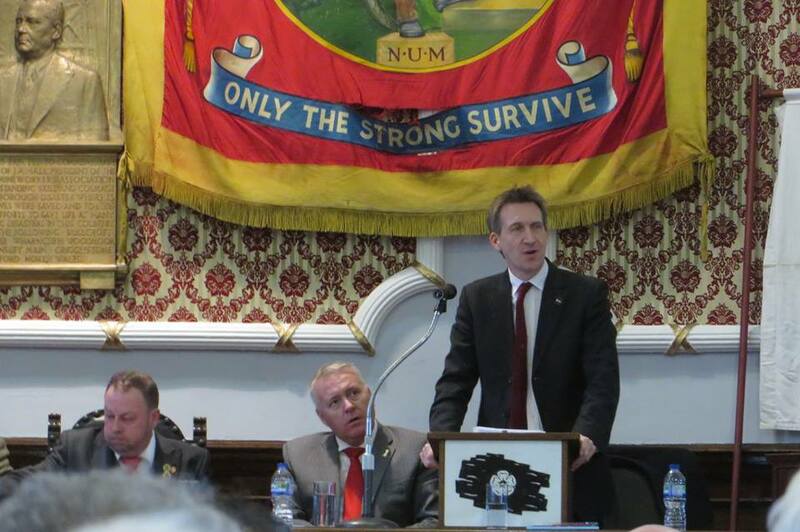 The event is free and is being organised by the Durham Miners’ Association with the support of a number of unions, including Unite and the GMB. 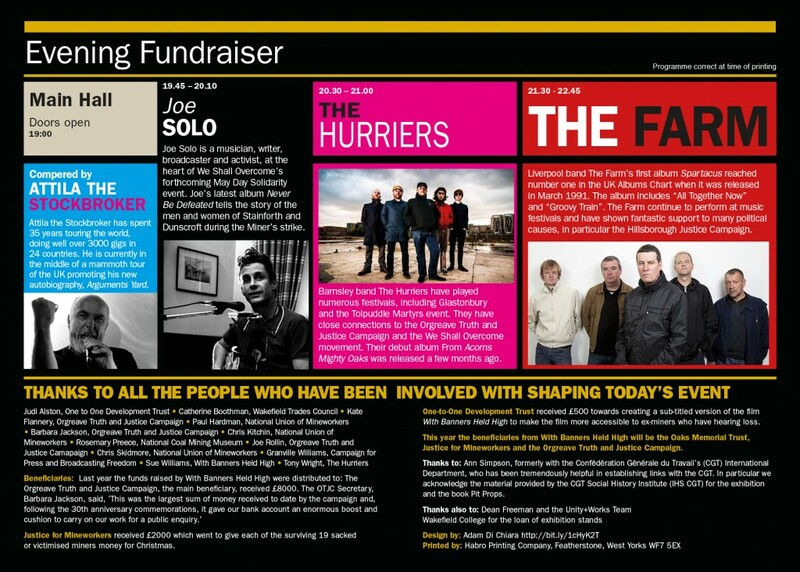 Watch out for further details about the programme of events or go to www.durhamminers.org. 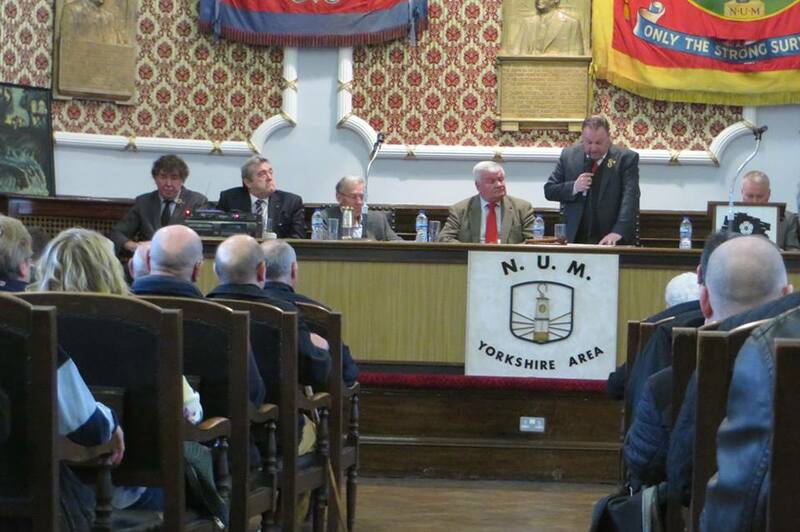 The Davy Jones, Joe Green Lecture on Saturday (14 March) at the NUM Headquarters in Barnsley. 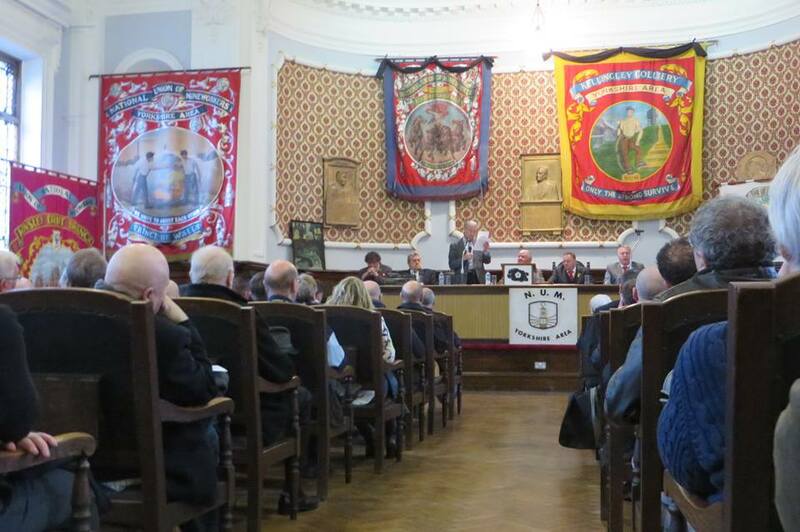 Another excellent event in commemoration of the 30th Anniversary of the Miners Strike. This article by Shamus Milne originally appeared in the Guardian. 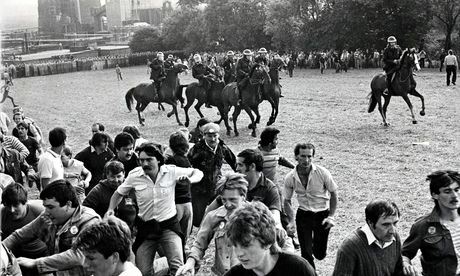 Thirty years ago, Margaret Thatcher branded striking miners “the enemy within”. The chilling catchphrase embodied her government’s scorched earth onslaught on Britain’s mining communities – and gave the green light for the entire state to treat the miners’ union as outlaws. 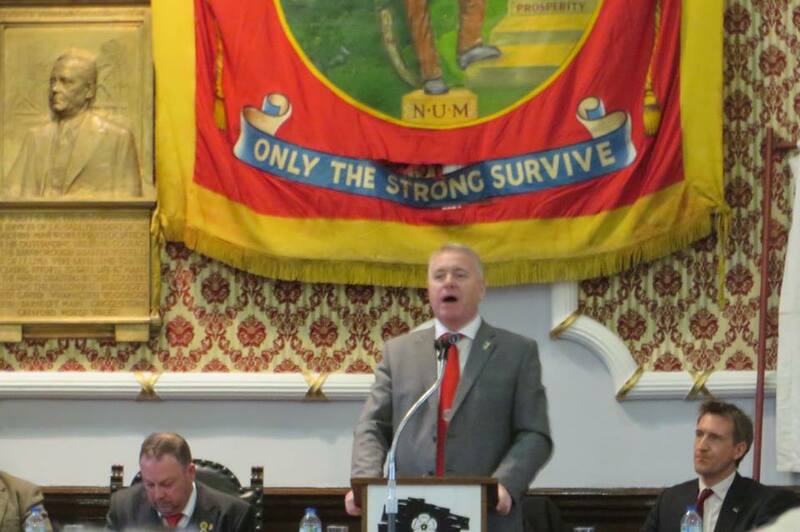 Now we know that the Tory prime minister intended to extend the charge of seditious insurrection, not only to leftwing Labour councils in Liverpool and London resisting cuts in services, but against the Labour party as a whole. All were “enemies of democracy”, she planned to tell the Tory conference, the publication of her private papers now reveals. It was only as a result of the IRA bomb attack on her Brighton hotel that she was prevailed upon to drop the line as too divisive. The fevered extremism of her comments – Labour’s leader Neil Kinnock was even absurdly described as a “puppet” of the miners’ president Arthur Scargill – are a reminder of the vengeful class fury of her government. Those who stood to defend union strength and the post-war social democratic settlement were seditious outsiders, to be destroyed in a domestic reprise of her Falklands campaign against the Argentinian dictator General Galtieri. But the remarks also reflect her government’s systematic resort to anti-democratic measures to break the resistance of Britain’s most powerful union: from the use of the police and security services to infiltrate and undermine the miners’ union to the manipulation of the courts and media to discredit and tie the hands of its leaders. A decade after the strike, I called the book I wrote about that secret war against the miners The Enemy Within, because the phrase turned out to have multiple layers of meaning. 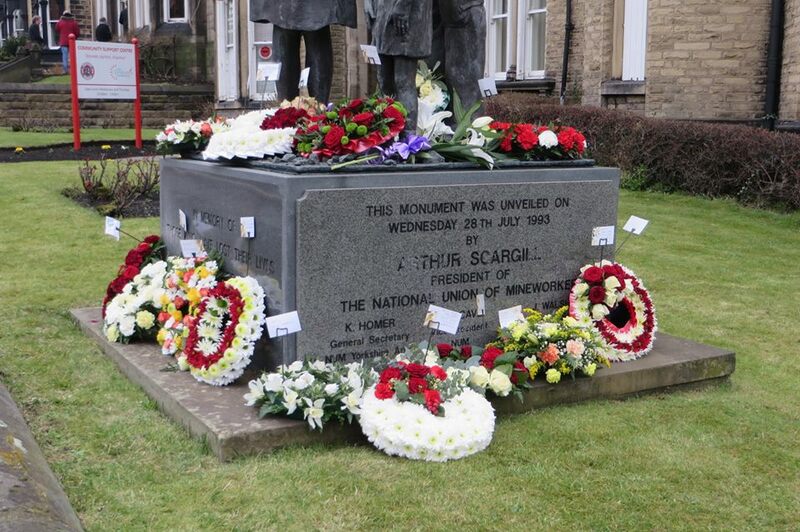 As the evidence has piled up with each new edition, the charge that Thatcher laid at the door of the National Union of Mineworkers can in fact be seen to fit her own government’s use of the secret state far better. In the years since, Thatcher and her former ministers and intelligence mandarins have defended such covert action by insisting the NUM leaders were “subversive” because they wanted to bring down the government. Which of course they did – but “legitimately”, as Scargill remarked recently, by bringing about a general election – as took place in the wake of the successful coal strike of 1974. In reality, as 50 MPs declared when some of these revelations first surfaced, Thatcher’s government and its security apparatus were themselves guilty of the mass “subversion of democratic liberties”. And, as the large-scale malpractices of police undercover units have driven home in the past couple of years, their successors are still at it today. A generation on, it is clear that the miners’ strike was more than a defence of jobs and communities. It was a challenge to the destructive market and corporate-driven reconstruction of the economy that gave us the crash of 2008. The outcome of the dispute brought us to where we are today: the deregulated, outsourced, zero-hours world of David Cameron’s Britain. That reality, and its vindication of the miners’ stand, is well understood 30 years later, and reflected in the power of contemporary films such as Pride and the new documentary Still the Enemy Within. Three decades on, it has become ever clearer that it wasn’t the miners or their leaders who were the enemy within. It was the secret state and those who wielded it against people defending their livelihoods across Britain. Support this important film project. 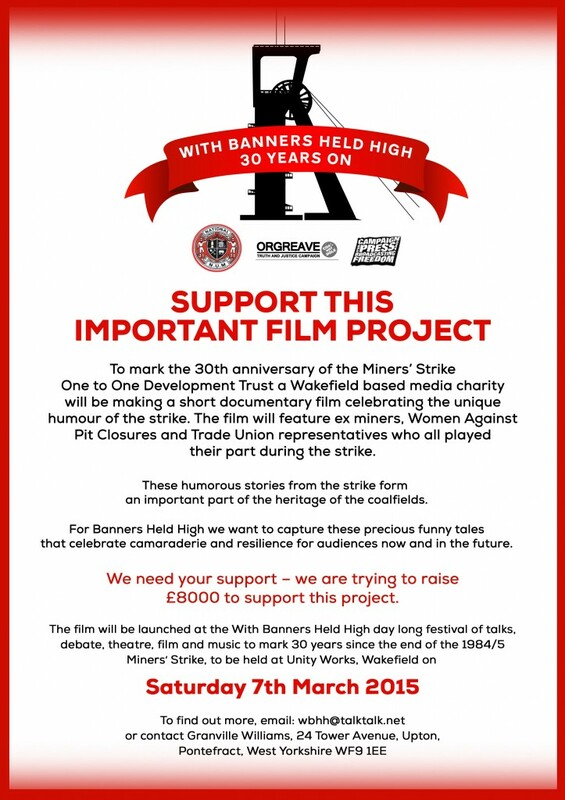 To mark the 30th Anniversary of the Miners’ Strike, One to One Development Trust, a Wakefield based media charity, will be making a short documentary film celebrating the unique humour of the strike. 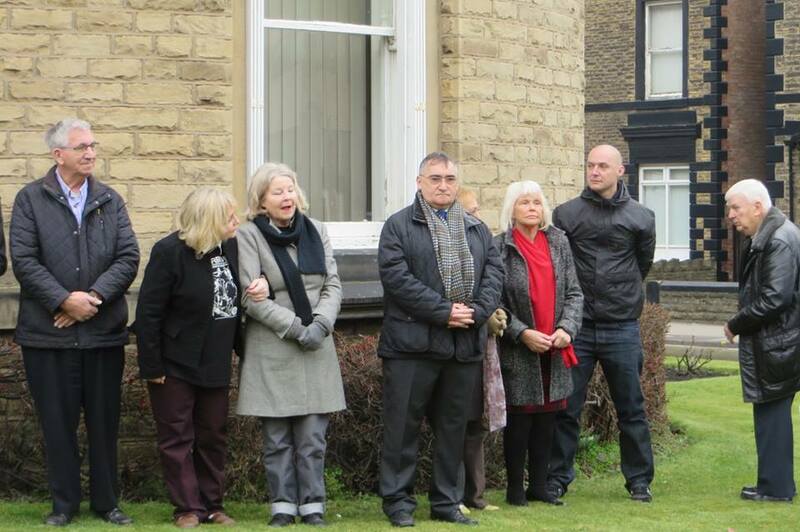 The film will include ex-miners, Women Against Pit Closures and Trade Union representatives who all played their part during the strike. These humorous stories from the strike form an important part of the heritage of the coalfields. For Banners Held High, we wanted to capture these precious funnytales that celebrate cameraderie for audences now and in the future. We need your support. We need to raise £8000 to support this project. 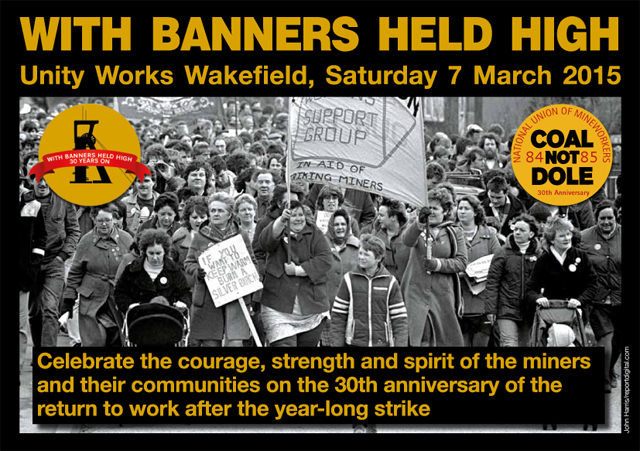 The film will be launched at the With Banners Held High day long festival of talks , debate,film and music to mark 30 years since the end of the 1984/85 Miners’ Strike to be held at Unity Works, Wakefield on Saturday 7th March 2015. To find out more email wbhh@talktalk.net or contact Granville Williams, 24 Tower Avenue, Upton, Pontefract, West Yorkshire WF9 1EE. 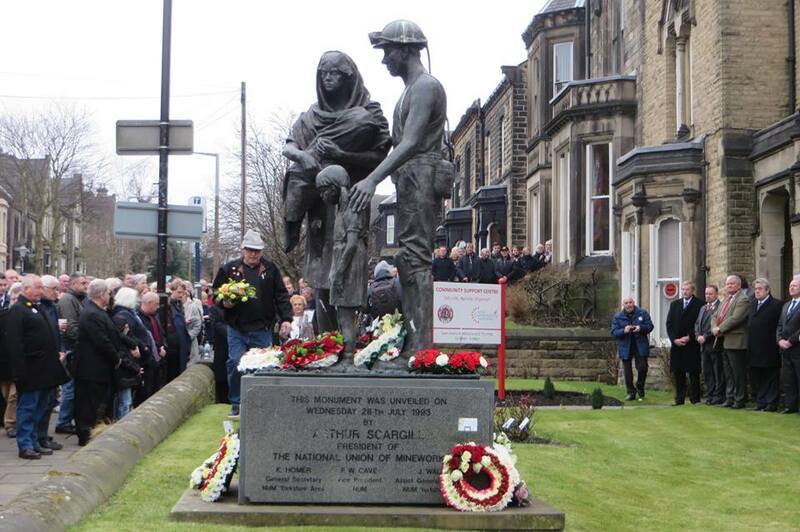 An all day event celebrating the courage, resourcefulness, strength and spirit of the miners on the 30th anniversary of their return to work at the end of a year-long struggle.